Go to original pattern for design DROPS 94-32. 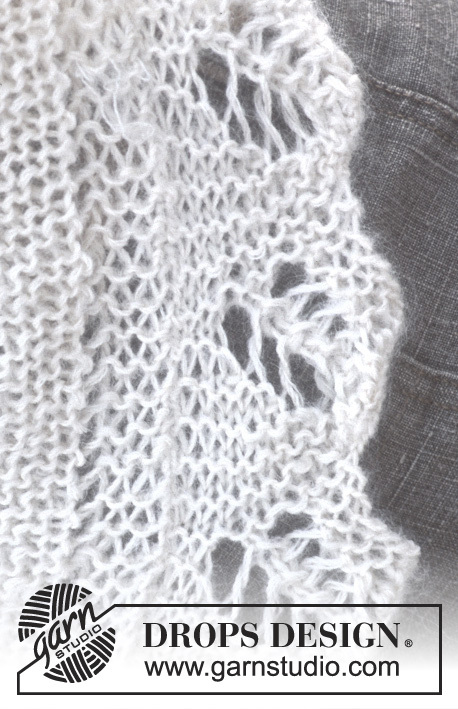 Measurement tips (applies to border): measure border against the shawl to make sure it’s the right length. 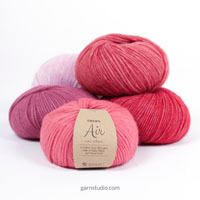 Shawl: The shawl is knitted in garter stitch. 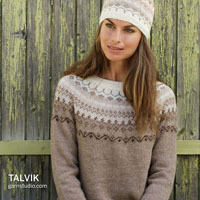 The border is knitted separately and sewn on afterwards. 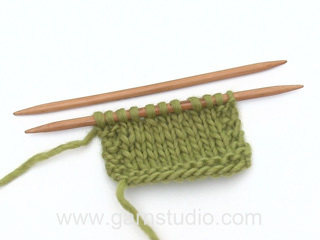 Loosely cast on 8 sts using needle size 6 and 1 thread of each yarn quality (double thread). 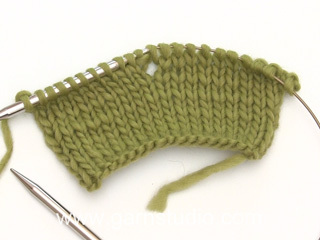 Knit 6 rows garter st. Continue in garter st and inc 1 st each side on every other row by making a yo within the 3 outermost sts. When piece measures approx 66 cm – measure flat – knit 2 rows garter st without increasing (there are approx 186 sts on row) and cast off loosely. 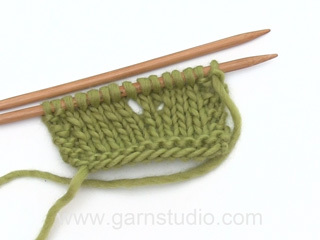 Border: Cast on 9 sts using both needles with 1 thread of each yarn quality (double thread). Remove 1 needle and knit M.1. Note that a blank square in diagram = garter st. 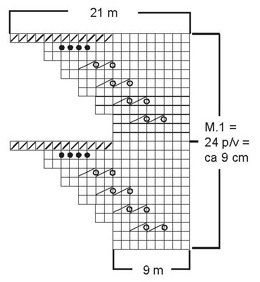 When border measures approx 2 m – see measurement tips – cast off very loosely. Assembly: Place shawl flat on table. Attach border with pins, start at the top of both sides and work down towards the point. When approx 10 cm left both sides of the point, insert a drawing thread in border and draw the border together so that it fits round the point. Sew the border to the shawl with small stitches in the outer loops of the outermost sts. Bonjour Nikiline, le châle se tricote de bas en haut, on augmente tous les 2 rangs pour obtenir la largeur totale (= 186 m environ). On tricote ensuite la bordure que l'on coud le long des 2 diagonales du châle. Bon tricot! 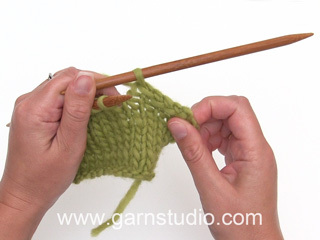 Dear Mrs Kilmurray, when you have to bind off 12 sts, bind off these sts at the beg from a WS row (= row 12 = from WS) so that 9 sts remain on needle to continue next repeat. Happy knitting! Eikö kukaan osaa auttaa pitsireunuksen tekoon ? Hei! Valitettavasti meillä ei ole resursseja tähän, mutta voit aina tuoda neuleen paikalliseen DROPS jälleenmyyjäliikkeeseen. He auttavat sinua mielellään. Mikäli läheltäsi ei löydy DROPS käsityöliikettä, saat varmasti apua myös muista käsityöliikkeistä. Miten teette pitsireunuksen, kun ei onnistu millään? Voisiko joku neuvoa ja kirjoittaa joka kierroksen ohjeet? Bonjour, J'aimerai savoir avec quelles laines et tricoté ce châle, car au début c'est marqué "châle drop en Alaska et Vivaldi. Et dans les fournitures c'est du drop Alpaca et drop Vivaldi. Merci. Bonjour Mme Lefaudeux, ce châle se tricote bien en Alpaca et Vivaldi, le titre a été corrigé, merci. Bon tricot! Bonjour Tiphanie, Les 24 rangs indiqués de M1 mesurent environ 9 cm. Bon tricot! Har kommit till spetskanten och förstår inte hur varv 12 ska stickas! Först är det alltså 9 rm och sedan 12 m som ska maskas av, men blir det inte konstigt med 8 m och sedan stort hål innan en sista m? Jo men det är de 12m ytterst som ska maskas av, du ser det på bilden. Lycka till ! In de beschrijving van Drops Patroon 94-32 wordt een instructievideo benoemd. Waar kan ik die vinden?